The pharmaceutical and health products industry has long been the top dog on K Street. Since 1998, the industry has spent more than $1.6 billion on federal lobbying. Last year alone, it spent more than $234 million — a sum that translates into roughly $125,000 every hour that Congress was actually in session. Furthermore, in the first three months of 2009, it spent more than $66.5 million on these politicking efforts — or about $1.2 million a day that Congress has been open for business. And these figures are just a portion of their overall expenditures. They also spend big on advertising, research, polling and other efforts that don't get classified as lobbying. Time-crunched lawmakers can only hear from so many constituents and interest groups before deciding on pressing issues. To compete in this marketplace of ideas and help promote their policy positions, pharmaceutical companies employ a legion of lobbyists. In 2008 alone, they employed some 1,814 lobbyists — and 1,309 are on their payrolls through March. 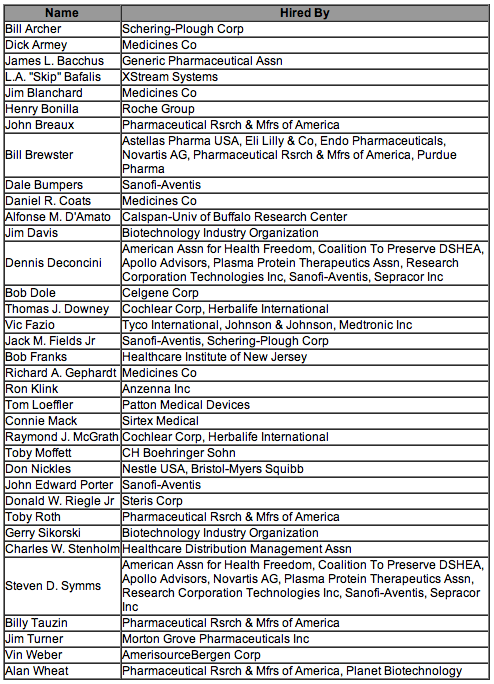 That is, 12 percent of all lobbyists perform work on behalf of pharmaceutical and health product companies. Moreover, one in five lobbyists employed by the pharmaceutical industry have morphed from public servant to private lobbyist through Washington's "revolving door." Thus, not only do these individuals bring with them strong advocacy skills, but many also boast thick Rolodexes, filled with connections from previous employment in the chambers of government itself. Former chiefs of staff, legislative directors, counsels, aides and even members of Congress often make compelling cases to government officials with whom they have relationships. And these relationships can also be crucial in obtaining a slice of a policymaker's precious time to begin with. According to CRP's analysis, pharmaceutical and health product companies currently employ nearly three-dozen former members of Congress. As of March, here is the list of former Senators- and Congressmen-turned-lobbyists, as well as the companies that have hired them. This year the industry is advocating "reform" that doesn't cut too deeply into its revenues. PhRMA, for one, opposes a federally administered public health care option. Instead, it is backing the expansion of private health insurance and increased federal incentives — including subsidies — for patients to enroll in existing programs like Medicare, Medicaid and the State Children's Health Insurance Program (SCHIP), with as much emphasis on private health insurance plans as possible. The drug companies also want to keep intact incentives for innovation, research and intellectual property right protections, which some say inhibits access to generic drugs. "I do not believe that policymakers have yet arrived at a full and complete diagnosis of what's wrong and what's right with U.S. health care," John C. Lechleiter, the head of Eli Lilly and Co, declared last month in a speech to the U.S. Chamber of Commerce. "I am very concerned that some of the proposed policies — the treatments, to continue my metaphor — will have unintended side-effects that make our situation worse." In the past, the industry has used its clout to position itself for legislative wins that have brought in billions of dollars. For instance, since President Reagan signed the Hatch-Waxman Act in 1984, generic drugs have made their way into the pharmaceutical market with more ease. But pharmaceutical giants regularly fight to delay competition with generics. In 2002, some U.S. senators sought to change that, in the face of nearly $130 million in lobbying expenditures by pharmaceutical and health product companies. Known as the Greater Access to Affordable Pharmaceuticals Act, the proposal would have limited drug companies to one 30-month extension of the right to exclusive sales of brand name drugs if the Food & Drug Administration approved a competitor's generic drug patent. The Biotechnology Industry Organization decried the measure as "a broadside attack on the U.S. patent system." While the Senate voted 78-21 to pass the legislation, the House never passed the bill out of committee. In another example, in the summer of 2003, then-Speaker of the House Dennis Hastert (R-Ill.) sponsored legislation to extend prescription drug coverage to Medicare patients, under a new feature known as "Medicare Part D." Some consumer groups and politicians criticized the bill for being too friendly to pharmaceutical and health insurance industries. Among the criticisms: It required senior citizens to pay the full amount for drugs between the initial coverage limit and the amount at which catastrophic coverage kicks in — commonly referred to as the "donut hole." It also barred the government from negotiating with drug companies for lower prices. This legislation originally passed in the House by just one vote, 216-215. And when it came time to vote on it again after working out differences between the House version and the Senate version, the vote in the House was conducted in the wee hours of the morning. Republican leaders even held open the voting process for a record three hours to garner enough votes to pass the measure. President Bush ultimately signed the bill into law in December. That year, pharmaceutical and health product companies spent more than $126 million on lobbying. And during the entire 2004 election cycle, the pharmaceutical manufacturers contributed nearly $10 million to federal candidates, with 70 percent going to Republicans. The top recipient: President Bush, who received more than half a million dollars. Later, legislators attempted to pass measures that would allow the government to negotiate with the drug companies. The Senate rejected such bills twice in 2005. By January 2007, the new Democrat-controlled House passed such a bill, but the Senate failed to overcome a cloture motionto move forward with the proposal as scores of companies lobbied regarding the plan. Similarly, in 2007, in the wake of the outrage — and litigation — following the numerous strokes and heart attacks caused by painkiller Vioxx, the Senate took up a measure to increase the FDA's regulatory powers. That year, pharmaceutical and health product companies spent more than $224 million on lobbying, and campaign contributions from the industry began to flow more evenly to both Democrats and Republicans. By the end of the 2008 election cycle, the sector contributed $29 million, with 50 percent going to Republicans — down from two-thirds or more in other recent cycles. The industry succeeded in removing language from the proposal that would have increased the FDA's authority to ban TV ads, tightened rules regarding conflicts of interest and call for the disclosure of all clinical studies related to a drug's risks. The legislation also included language that would have eased individuals' abilities to import prescription drugs from Canada. But before passage, the Senate voted 49-40 on a pharmaceutical industry-backed amendment to add more restrictions to the importation process. After these votes, the bill eventually passed on a 93-1 vote — and was signed by the president later that fall. The bill's lone dissenting vote in the Senate came from Vermont independent Bernie Sanders. Sanders, who caucuses with the Democrats, lamented the triumph of special interests and told media at the time that he could not vote for the watered down bill. "A safe drug doesn't mean anything to somebody who can't afford it," he said. "Big money has significant influence. Big money gains you access, access gives you the time to influence people." Pharmaceutical companies have long thwarted legislative attempts to allow the importation of prescription drugs from Canada. PhRMA even hired former U.S. ambassador to Canada Gordon Giffin for six years to lobby the Canadian government against easing rules governing Americans' importation of Canadian drugs. But after more than a decade, the industry's influence on this particular issue may be waning. After Democrats took control of Congress in 2007, House Republicans led an unsuccessful effort to continue enforcement of the ban. By December, President Bush signed a budget bill that included a provision disallowing U.S. Customs & Border Protections from preventing Americans from importing up to three-months worth of Canadian prescription drugs. Three months later, the Senate passed a non-binding resolution in support of legalizing such importation. The Obama administration itself is hoping to overcome the pull of the powerful industry to enact an overhaul of the health care system that dramatically reforms it brings down costs and grants affordable coverage to all Americans. "Fixing this broken system will be enormously difficult," Obama recently wrote in an e-mail to supporters. "Our opposition will be fierce, and they have been down this road before. To prevail, we must once more build a coast-to-coast operation ready to knock on doors, deploy volunteers, get out the facts, and show the world how real change happens in America." Whatever operation the Obama team crafts will indeed face challenges, including the persuasive force of $1.2 million a day in lobbying expenditures. CRP Researchers Matthias Jaime and Greg Gasiewski contributed to this report.